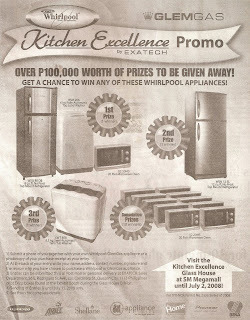 Kitchen Excellence Promo ~ Philippine Freebies, Promos, Contests and MORE! Having a Whirlpool or GlemGas appliance at your house can let you win more Whirlpool appliances. Join Kitchen Excellence Promo by simply submitting a picture of your Whirlpool or GlemGas appliance or a photocopy of your purchase receipt and writing what made you buy it. Deadline of sending entries is July 15 so send now!